Windows 6.1 is officially out, and after a hands on with the standard and professional versions of the refreshed OS, I'm still not sold on it. There's no denying the redesigned home screen is beautiful, and easily takes you to emails, texts and events for the day. But it still doesn't make up for the laggy nature of the OS and the menu surfing required to perform simple tasks. Once you get past the homescreen, you're pretty much back to the same context menu-based system of navigation. The main difference between the Professional and Standard editions is that Professional is designed around a touchscreen and Standard is designed around a QWERTY Keyboard and soft keys. For the Professional edition I used an HTC Touch Dual and for Standard edition, I used an HTC S620 and a Moto Q9w. Some of the new features include Adobe Flash Support, Silverlight support, a new camera interface and the inclusion of the Microsoft Live search engine. 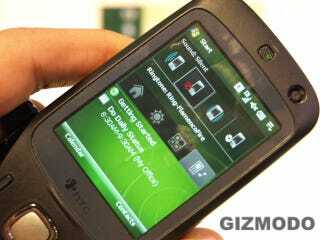 Putting Flash to the test with YouTube on an HTC Touch Dual was more or less a disaster. The page is slow and clunky to navigate, video constantly buffers, and when video does play, it is artifacty and pixelated. The Microsoft Live search works pretty well on the HTC SC29. It provides a clean and clear page for results, and is pretty responsive. When the camera app worked, it wasn't bad at all. It repeatedly froze on the HTC Touch Dual and required a hard reset to get going. It worked flawlessly on the HTC S620. The Interface includes a translucent overlay on top of the viewfinder display and options for zoom and exposure. The fonts and colors are new, but the backbone isn't. Little things like switching between the inbox and sent folder for text messages is no easier than it was before. When browsing the apps menu, I find it silly you still have to click the "More" softkey to bring up all the apps. With the emphasis on multimedia features in phones lately, I'm surprised there isn't a new Windows Media Player interface. I still have to use the context menus to go from the Now Playing screen to the Library, which involves a lot of unnecessary clicking. Overall responsiveness isn't horrible, as it only only seriously lags when trying to get back to the home screen. The 6.1 update is a slight improvement over its predecessor, but Windows Mobile still has some work to do.